New England Patriots quarterback Tom Brady (12) and Los Angeles Chargers quarterback Philip Rivers (17) speak at midfield after an NFL football game, in Foxborough, Massachusetts, Oct. 29, 2017. 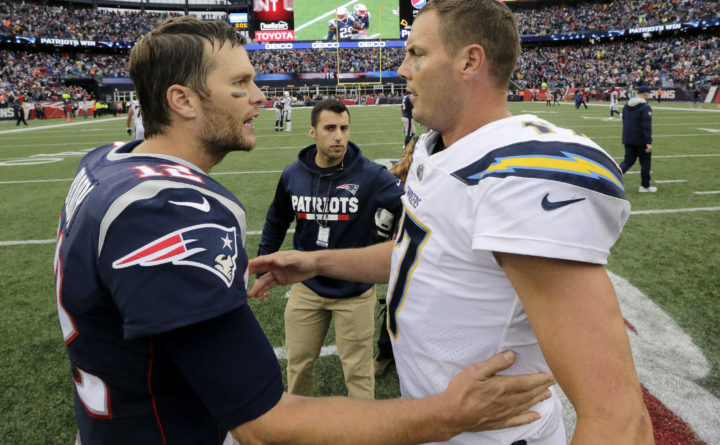 The Chargers and Patriots meet in a divisional playoff game on Sunday. FOXBOROUGH, Massachusetts — Tom Brady typically shrugs off any mention of records or milestones he sets. The Chargers are facing a Patriots team that is 8-0 in Gillette Stadium this season. But Los Angeles is 8-1 on the road, with its lone blemish coming against the crosstown Los Angeles Rams. They are 13-0 at home since 2011 in games in which the temperature was 32 degrees or colder.